At roughly 9 pm on Friday evening, Admiral Allen approved BP’s plan for replacing the cap on the Deepwater horizon well, and proceeding with the intersection of the well itself. That plan includes two things of interest. The first is the schedule itself, while the second correlates the measured depths (MD) with the true vertical depths (TVD) so that the different illustrations that I have used in the past, and the Admiral’s briefing numbers can now be correlated. 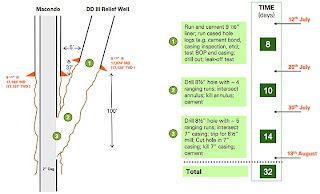 Note that the lower sections of both wells are shown with rough walls indicating that the wells are not lined over those intervals, and that the walls of the hole are relatively rough rock - albeit perhaps not as rough as the scale might imply. The BP letter shows that the final casing run has yet to be made, and that this is scheduled to take 8 days. The schedule for the replacement of the cap is anticipated to take 5 – 9 days, depending on how the job flows and what contingencies have to be implemented. Seems like there is a pretty close result either way the well turns. 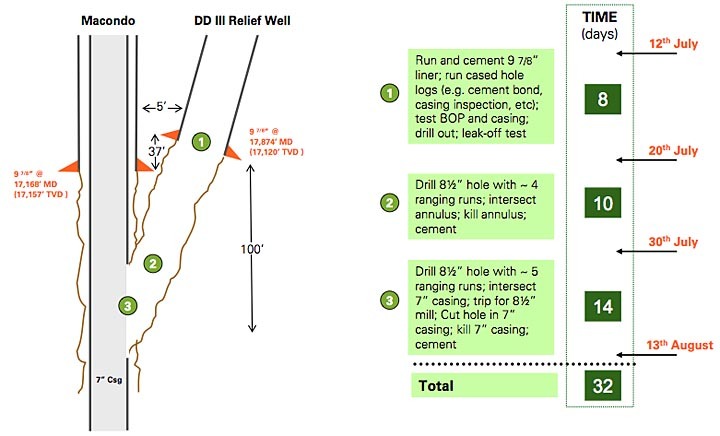 Replace the cap (amount of oil escape)= the time period of the current caps leakage until the relief wells impact. (for so little net effect) a consideration that the relief well may not work? Once they have the cap in place it might be possible to shut the well in just by closing valves. But there are a number of component parts that might be damaged, and need to be checked first.